NW native plant Sword fern can be planted in less than ideal soil with good results. People dream of a landscape that will need no watering. Sometimes because they think it will be less work but more likely these days they recognize that water or the lack of it is a problem that will continue to grow. Like the Brits in World War II they want to do their bit to help with a very real problem. 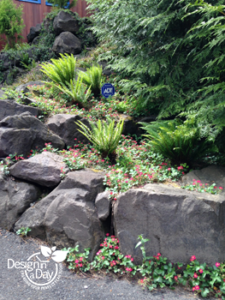 One way to have a no water landscape is to use NW native plants that are drought tolerant. Here are some tips to help you have more success. They will establish better with a bigger root ball. Expect 15 to 20 percent of your plants to fail. Try not to take it personally. Natives are a little more particular than other plants. Use 2 gallon sized plants not 4 inch or 1 gallon for best results with native plants like Salal-Gaultheria shallon, Ocean Spray-Holodiscus discolor, Huckleberry-Vaccinium ovatum, Current-Ribes sanguineum or the favorite native of all, Vine Maple-Acer circinatum. If you are planting Sword fern Polystichum munitum, save your money and buy smaller plants, like a 1 gallon. Sword fern can also be planted in less than ideal soil with good results. It’s the only NW native plant that doesn’t need careful soil preparation. I’ve transplanted it from my woods and had it play dead for over one full year. It came up the second year and was back to a three foot wide fern by the third year. Fascinating. This plant can be killed but one would have to work at it. It can tolerate summer water and will look more attractive watered when planted in a sunny area. In shady areas it has looked quite attractive without a drop of summer water by the third year. has recently been approved for City of Portland street trees. 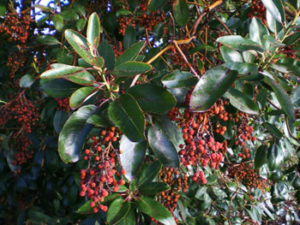 Madrone-Arbutus menziesii is perfect for a no water landscape and is very picky about how and where it is planted. This is because unlike most trees it has a tap root so it does not thrive in a pot for long. In the past I’ve only successfully planted a 6 inch tall plant. Recently friends of trees has found a way to grow them to about 5′ feet tall and plant them in parking strips. They are a needed plant for hosting rare butterflies so if this succeeds it will be very exciting. Two important tips for success with your new Madrone; water sparingly the first summer, and do not ever fertilize. After the first summer is over, never water your Madrone again. 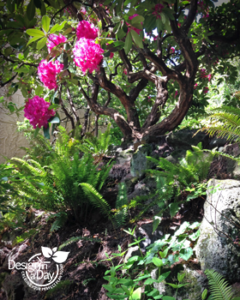 Don’t plant anything else within ten feet that needs summer water and don’t prune your Madrone. It’s a beauty that requires planned neglect for success. At this time I do not have a retail source for the larger Madrone. If you want one, buy the 6″ size at a native plant sale. They grow surprisingly fast. 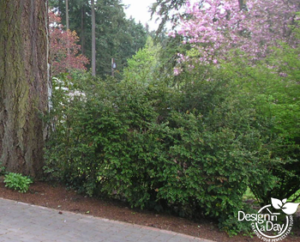 Vine maple with single trunk fits small city landscapes. Multiple stemmed trees will get too wide. The most typical mistake I see in small city landscapes is multi stem Vine maples horribly disfigured with poor pruning because they got too big. Most small city landscapes are not big enough for a multi stem or clump version of Vine maple – Acer circinatum. Instead I select a single trunk Vine maple from one of my wholesale growers. A single trunk tree will not get too wide. Plant in fall for best results with native plants. Planting in late winter and early spring works almost as well. 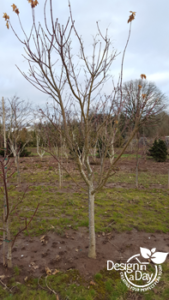 Planting in mid spring or summer will require more summer watering and some natives have an adverse reaction to summer water but their roots are not established well enough to go without water for the first summer so it’s a dilemma. Avoid this dilemma by planting in the fall or early spring. Evergreen Huckleberry used as a screen in SW Portland. Evergreen Huckleberry-Vaccinium ovatum is almost like two different plants. Planted in a sunny area it grows slowly to 4’ tall and perhaps 3’ wide. While it will continue to grow and get a little bigger each year, it’s very slow growing. Compare it with the same plant in part shade to heavily dappled shade and it grows faster and is often in the 6 to 8 foot tall by as wide. People use the berries in muffins, pancakes and jam. The flavor is mild from plants in low elevations and more flavorful in higher elevations. Birds will eat them but don’t tend to use them for baked goods. 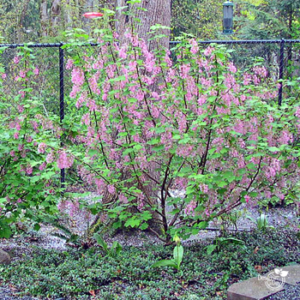 Flowering current – Ribes sanguineum is a spring pick me up for people and nectar for hummingbirds. Plant too deep – Dig the hole several inches deeper than the root ball of the new plant. Plant them in the lowest area of your property. Water them every day their first summer. They might live a few months but will die in their first winter even if you only over watered them in the summer. Dig the hole twice as wide but only as deep as the root ball of the new plant. Plant 1” too high and bring soil to the plant. Water carefully the first summer. A slow soak rather than daily light sprinkles of water is best. Mulch the plant in the fall and spring, don’t fertilize. NW Native Sword fern – Polystichum munitum has upright fronds in sun and horizontal low fronds in shade. As a Portland landscape designer, when I have clients who want no water landscapes, I tend to mix other plants with NW native plants. My list for a full sun area might look like this: Spanish lavender, dwarf Manzanita groundcovers, Oat grass, heather, California lilac, true dwarf pines, smoke tree, madrone, Grama grass, dwarf Fountain grasses, Rosemary, Hebe, stepables like Elfin Pink Thyme. If you are looking for drought tolerant landscaping, contact Carol for more information on Oregon native plants.